[S1111] Herbert L Singletary Grave Stone, Find a Grave, www.findagrave.com. Mittie Ellis is the daughter of (?) Ellis and Allie Engram. Helen Ellis is the daughter of (?) Ellis and Allie Engram. Ben Ellis is the son of (?) Ellis and Allie Engram. Joe Ellis is the son of (?) Ellis and Allie Engram. Information from Dorothy Lemstrom on PRODIGY from "The Hildreth Family Book". No children of this marraige. Quincy Ann Whittle was also known as Edge. She was born on 4 October 1826.1 She married Travis Zaccheus Hildreth, son of Reverend Benjamin J. Hildreth and Jemima Anna Dowling, in 1857. As of 1857,her married name was Hildreth. William C. Hildreth was born in 1824 in South Carolina. He was the son of Reverend Benjamin J. Hildreth and Jemima Anna Dowling. William C. Hildreth married Milly Unknown. He appeared in the Alabama State Census in Coffee County, Alabama in 1850 and the U.S. Federal Census (District 26, Coffee County, Alabama) in 1850. He served as a a Private in the 57th Regiment, Alabama Infantry, Company G in the Confederate Army during the Civil War. William C. Hildreth lived on 22 June 1880 in Covington, Alabama. He lived in 1900 in Loango, Covington County, Alabama. From Dorothy Lemstrom on PRODIGY from "The Hildreth Family" book. Harriet Calloway Hildreth was born on 17 January 1825 in Charleston, Charleston County, South Carolina. She was born on 17 June 1825 in Charleston, Charleston County, South Carolina. She was the daughter of Reverend Benjamin J. Hildreth and Jemima Anna Dowling. As of 1840,her married name was Grimes. Harriet Calloway Hildreth married Henry Benjamin Grimes on 10 March 1840. Harriet Calloway Hildreth died on 20 February 1883 in Brandon, Hill County, Texas, at age 57. Susan Hildreth was born in 1827. She was the daughter of Reverend Benjamin J. Hildreth and Jemima Anna Dowling. Susan Hildreth died after February 1891 in Greenville, Bulluck County, Alabama. Her married name was Bailey. Sarah Hildreth married M. J. Bailey. Sarah Hildreth was born in 1833 in Dale County, Alabama. She was the daughter of Reverend Benjamin J. Hildreth and Jemima Anna Dowling. Sarah Hildreth died after February 1891. From Dorothy Lemstrom on PRODIGY from "The Hildreth Family" book. James Marion Hildreth was born in June 1836 in Dale County, Alabama, 1850 US Census has him born around 1840.1 He was the son of Reverend Benjamin J. Hildreth and Jemima Anna Dowling. James Marion Hildreth married Mary Lou Folsom in 1856. James Marion Hildreth died on 15 May 1908 in Paul, Conecuh County, Alabama, at age 71. Martha M. Hildreth was born in 1838 in Dale County, Alabama. She is has a twin sister although that is called into question based on the 1850 US Census for this family.1 She was the daughter of Reverend Benjamin J. Hildreth and Jemima Anna Dowling.1 Martha M. Hildreth died in Greenville, Butler County, Alabama. From Dorothy Lemstrom on PRODIGY from "The Hildreth Family" book. Frances Hildreth was born on 6 May 1840 in Dale County, Alabama. She was the daughter of Reverend Benjamin J. Hildreth and Jemima Anna Dowling.1 Her married name was Curenton. Frances Hildreth married Elbert Wright Curenton after 1855. Frances Hildreth died on 1 July 1913 at age 73 (Her tombstone states her death as 9/1/1913.) She was buried at Piney Grove Cemetery, Samson, Coffee County, Alabama. John B. Hildreth was also known as John M. Hildreth.1 He was born in 1844 in Dale County, Alabama.1 He was the son of Reverend Benjamin J. Hildreth and Jemima Anna Dowling.1 John B. enlisted as a private in Company A, 54th Alabama Infantry. Robert Henry Jackson Hildreth was born on 20 April 1846 in Dale / Coffee County, Alabama, Some indicated his birth date was April 30th.1,2,3 He was the son of Reverend Benjamin J. Hildreth and Jemima Anna Dowling.3 Robert Henry Jackson Hildreth married Julia Spikes Hamner, daughter of Wesley Hamner and Mary Maria (Polly) James, on 24 December 1868. Founded South Side Methodist Church in Enterprise, Coffee County, Alabama. 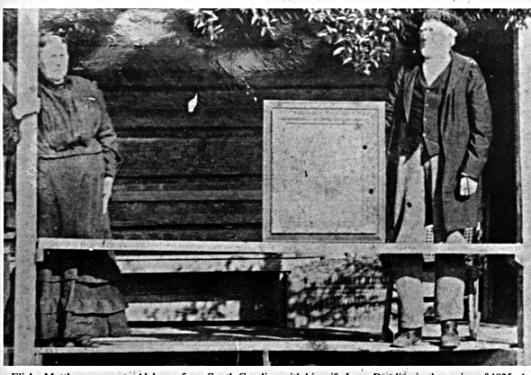 In 1889, Rev. Robert Henry Jackson Hildreth opened and operated a gristmill and sawmill on Harrand Creek, near the intersection on East Lee and Boll Weevil Circle [ in Enterprise, Alabama].4 Robert Henry Jackson Hildreth purchased land on 1 December 1891; Bought 120.54 acres of Coffee County, Section 21, T4-N, R22-E. He married Annie Ruth Carmichael, daughter of (?) Carmichael and (?) Unknown, on 4 July 1893.1 Robert Henry Jackson Hildreth died on 12 November 1907 in Enterprise, Coffee County, Alabama, at age 61. He was buried at City Cemetery, Enterprise, Coffee County, Alabama; R.H.J. Hildreth is buried beside his second wife, Annie Carmichael, in the Hildreth plot in Enterprise City Cemetery, Coffe County, Alabama, and near his parents, Benjamin Hildreth's monument and Jemima Hildreth's grave. [S3697] Email from Art Bryan dated June 2016 to Hunter Wayne Bagwell; Subject Line: Email about Muncie Decora Hildreth Family. Saphronia Jane Hildreth was also known as Sophia. She was born on 3 August 1848 in Haw Ridge, Dale County, Alabama. She was born in 1849 in Dale County, Alabama.1 She was the daughter of Reverend Benjamin J. Hildreth and Jemima Anna Dowling.1 As of 18 November 1868,her married name was Lang. Saphronia Jane Hildreth married John Wesley Lang on 18 November 1868 at Butler County, Alabama. Saphronia Jane Hildreth died on 22 May 1928 in Pensacola, Florida. Milly Unknown married William C. Hildreth, son of Reverend Benjamin J. Hildreth and Jemima Anna Dowling. Henry Benjamin Grimes was born on 10 June 1820 in Goldsboro, Lenior County, North Carolina. He married Harriet Calloway Hildreth, daughter of Reverend Benjamin J. Hildreth and Jemima Anna Dowling, on 10 March 1840. Henry Benjamin Grimes died on 25 March 1859 in Haw Ridge, Coffee County, Alabama, at age 38. M. J. Bailey married Sarah Hildreth, daughter of Reverend Benjamin J. Hildreth and Jemima Anna Dowling. Mary Lou Folsom married James Marion Hildreth, son of Reverend Benjamin J. Hildreth and Jemima Anna Dowling, in 1856. From Dorothy Lemstrom on PRODIGY from "The Hildreth Family" book. Elbert Wright Curenton was born on 12 October 1839 in Dale County, Alabama. He married Frances Hildreth, daughter of Reverend Benjamin J. Hildreth and Jemima Anna Dowling, after 1855. As of after 1855, Elbert Wright Curenton was also known as Elbert Wright Curenton. He died on 5 March 1896 in Dale County, Alabama, at age 56. He was buried at Level Plaines Baptist Cemetery, Dale County, Alabama. [S1470] Julia Spikes Hamner Hildreth Grave Stone, Find a Grave, www.findagrave.com. From Dorothy Lemstrom on PRODIGY from "The Hildreth Family" book. John Wesley Lang married Saphronia Jane Hildreth, daughter of Reverend Benjamin J. Hildreth and Jemima Anna Dowling, on 18 November 1868 at Butler County, Alabama. ITEM, I do hereby nominate Constitute and Appoint my loving Friends, James Commander John Walker and Henry Peronneau Executors of this my said last Will and Testament, by me heretofore made or declared either by Word or Writing, and do only allow of, and Confirm this to be my last Will and Testament, IN WITNESS whereof I the said Burtenhead Boutwell, to this my said last Will and Testament, have set my hand and Seal, the Twenty Sixth day of February, in the first year of thousand, seven hundred, Sixty one. Sealed published and declared by Mr. Burtenhead Boutwell, as and for his last Will and Testament in the presence of us who who [sic] in the Testators presence, and at his Request have severally set to our respective Names as Witnesses, to the Same. William Lloyd, Arthur Peronneau, Thomas Stanyarne. No. 1 Of my Lands or plantations (without Impeachment of Waste) and to exercise, work, employ, use and Occupy all or any of my Slaves Stock of horses Cattle or Other Goods and Chattels, and to dispose of the produce and fruits of their and every of their [sic] Labour, Service and profits, and to receive, Collect pay and Apply the same and every part and parcel. Elizabeth Commander was born circa 1739 in Craven, South Carolina. She was the daughter of Samuel Commander and Elizabeth Unknown. As of circa 1751,her married name was Boutwell. Elizabeth Commander married Burtonhead Boutwell, son of Samuel Boutwell and Anna Margareita Spruill, circa 1751 at New River, Onslow County, North Carolina. 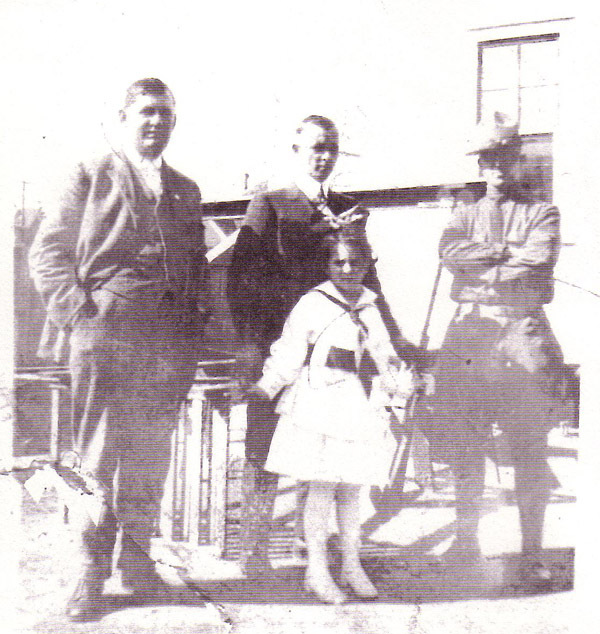 Children of Mary (Polly) Boutwell and James Dennis Dowling Sr.
[S177] SAR: James Dowling, Sr for George Butler.